This chapter was all about mobile devices, including Tablets. Most people have noticed how mobile technology has infiltrated our classrooms. Whether it is students using cell phones to scan QR codes or use the calculator, or a 1:1 initiative of iPads or Chromebooks, it is hard not to notice how technology driven our everyday classroom tasks have become. This chapter discussed the pros and cons of digital devices. Of course, they are lightweight, children are intuitive in learning them (my 4 year old can successfully do everything he wants on the iPad), and they engage students. Who wouldn't rather do an interactive activity on the iPad instead of listen to a lecture and take notes? Many teachers even use them as an incentive to get worksheets completed (if we finish this math worksheet, you can have 5 minutes of free time on the iPad). Of course, with the good comes the bad. Many schools don't have the funding to get these digital devices. So there is becoming a great divide among schools who are investing in technology and those who simply can't. 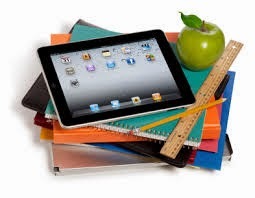 With the Common Core tests being web-based, many schools are being forced to use funds to purchase web-enabled devices. But this concerns me because I'm afraid that people are rushing out to purchase devices without gathering all of the necessary information. Technology is an investment, and unfortunately technology changes so quickly that usually when you have figured out everything about your new devices, something newer comes out (hello, iPhone!) and it all changes. There are also many precautions about security (what will students be able to do? ), and responsibility (if the technology gets broken, who pays?) Many schools took the safe route and locked down Twitter, Instagram, Facebook. But there are many teachers who use these platforms to meet students where they feel the most comfortable, and now they can't complete the lessons they had planned. I think having technology is great, and I love how it comes so naturally to our students. We need to be careful about how strict our policies are when it comes to usage, and we need to encourage our teachers to use technology to enhance their lessons, not just use technology for the sake of technology.